The 10 µm scale bar applies to figs. 2 and 4; the other figs. each have their own scale bar. Figs. 1-4.Collosphaera centripetalis . Fig. la,b. Collosphaera centripetalis forma brattstroemi. BSS 28B(VIII/958). Figs. 2-4: forma invaginata. The fine-pored structure in fig. 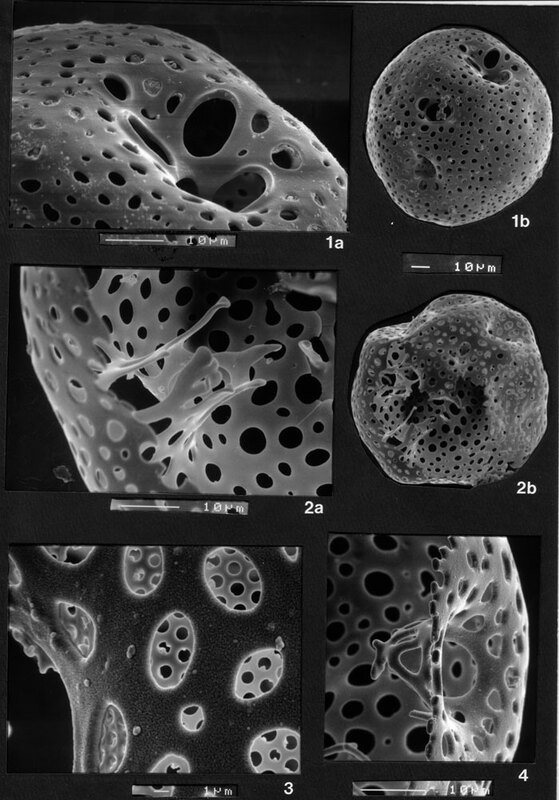 3 (presumably a diatom test) appears to have fused with the inner face of the skeleton. Note also the fine granular structure of the outer face of the shell wall in comparion to the diatom test and the inner face (fig. 2a). BSS 28B(VIII/807, 1015 and 731).